A controversial British politician convicted of inciting racial hatred could soon be sipping tea with Queen Elizabeth at one of her annual garden parties. 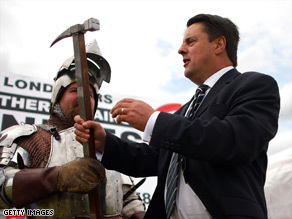 British National Party leader Nick Griffin, right, pictured in August last year at a party political event. Nick Griffin is the leader of the British National Party, a right-wing group that opposes immigration and wants Britain to withdraw from the European Union. But pressure was mounting Thursday for Barnbrook to pick someone else. "Unless Mr. Barnbrook brings a more acceptable guest along and doesn't turn it into a political stunt, the invitation will be rescinded," Assembly Chairman Darren Johnson said. Johnson spoke after London Mayor Boris Johnson asked him to intervene in Barnbrook's plans, the assembly said in a news release. "We cannot tolerate any such abuse of the invitation or any potential embarrassment to Her Majesty," the mayor wrote in a letter opposing Barnbrook's choice of guest. Griffin was convicted of inciting racial hatred in 1998, a London court official said. He was ordered to serve nine months in prison, a sentence that was suspended for two years, the court official added. Griffin was elected leader of the BNP the following year and re-elected in 2007, according to the party. Queen Elizabeth hosts at least three garden parties every summer at Buckingham Palace as a way to reward and recognize public service. About 8,000 people attend each one, Buckingham Palace says. People are invited on the recommendation of local and national organizations, which are given a quota of tickets, the palace says. In this case, Barnbrook was in line to receive an invitation because he is a recently elected member of the London Assembly, which was allocated a certain number of seats, the assembly said. The palace said it has not yet sent out any invitations. Asked about Griffin's possible attendance at a garden party, a palace spokesman indicated a guest would be refused only if he is judged to be a direct threat to security. "The queen does not scrutinize and is not consulted on the list of accompanying guests, as they are official guests and not personal invitations," said the spokesman, who asked not to be named in line with policy. "Buckingham Palace relies entirely on the nominating organizations" to compile their guest lists, the palace spokesman added. Spokespeople for the London Assembly said at issue was not Barnbrook's invitation, because he is entitled to receive one as an elected member of the local government. "The bone of contention here is his choice of person to accompany him," said an assembly spokesman, who asked not to be identified in line with policy. Barnbrook dismissed "hysteria" over the issue as a "to-do and a hoot." In comments on the party's Web site, Barnbrook said that if he had the chance to speak with the queen at the party, he would raise the issue of knife crime education among children. "I would also like to wish her a very happy summer and sample some of her famous tea and clotted cream, which I hope comes from her son's estate in Cornwall," Barnbrook said. Garden parties have been held at Buckingham Palace since Queen Victoria began them in the 1860s, the palace says. The queen and her husband, the Duke of Edinburgh, circulate among the guests so that everyone has an equal chance of speaking to a member of the royal family, the palace says. Guests are served tea and refreshments from long buffet tables and "the quantities served are enormous," the palace says. At a typical garden party, around 27,000 cups of tea, 20,000 sandwiches and 20,000 slices of cake are consumed. A staff of about 400 will serve guests, according to the palace.